These 100% Arabica beans are infused in small batches with just a touch of Kentucky's signature spirit. For the finale of a great meal, you may be torn between two fingers of bourbon, or a comforting cup of coffee. Why not have both? These 100% Arabica beans are infused in small batches with just a touch of Kentucky's signature spirit, giving them an irresistible aroma and unique flavor profile. Brew a pot to accompany post-dinner party conversation or for a Sunday brunch kick. Caffeinated, but contains no alcohol. Roasted in Tennessee. Seal bag to maintain freshness. Add the desired amount of grounds to the filter: about 1 tablespoon per 5 to 6 fl. oz. of cold water for regular coffee, and 2 tablespoons per 5 to 6 fl. oz. for strong coffee. Wanted to give this as a gift to so many people! I bought this as a gift for a surgical mentor. It was perfectâ€”they love both coffee & bourbon, so why not combine them? If you're a bourbon fan but this coffee, it's well roasted and the flavor and aroma are subtle yet very tasty. I'm on my second bag and will buy more when I run out! Tastes like an Irish Coffee. This brew tastes like an Irish Coffee without the cream and without the Irish whiskey. Now, I'd of course prefer it with, but this is a great alternative especially for mornings before work. This was perfect for my coffee fanatic dad who loves to start with whole beans. He said the aroma was great, but it tasted even better. Truly a great gift! 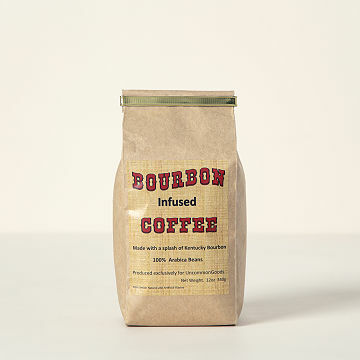 The smooth taste of Coffee & Bourbon infused together! This was one of many gifts I sent my to son for his 30th Birthday. I tried to make the BIG 3 0 birthday special. He likes unusual gifts, so when I saw this gift I knew he'd be surprised. He enjoys both coffee & bourbon, so I figured this was worth a try. He said he was very pleasantly surprised how good this tasted! I recommend this great gift for someone who enjoys coffee & bourbon. We are bourbon lovers and wanted to give this a go. It's great-tasting and not over-powering. I suspect it would be great to bake with (like an alternate coffee for Tiramisu, or a coffee cheesecake with bourbon caramel, etc), as we are die hard coffee people. Yummy stuff!